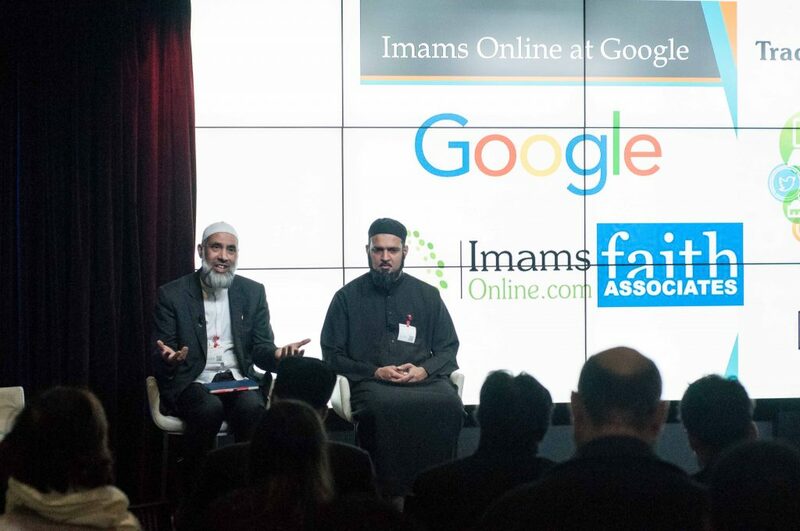 On January 11, Faith Associates and Imams Online hosted a ‘Digital Summit’ at Google UK’s London Event Space which was attended by over 150 attendees. This event’s aim was to bring together a diverse cross-section of Muslims which included senior religious leaders, male and female scholars, community activists, civil society actors, heads of charities, technologists, students and educationalists. 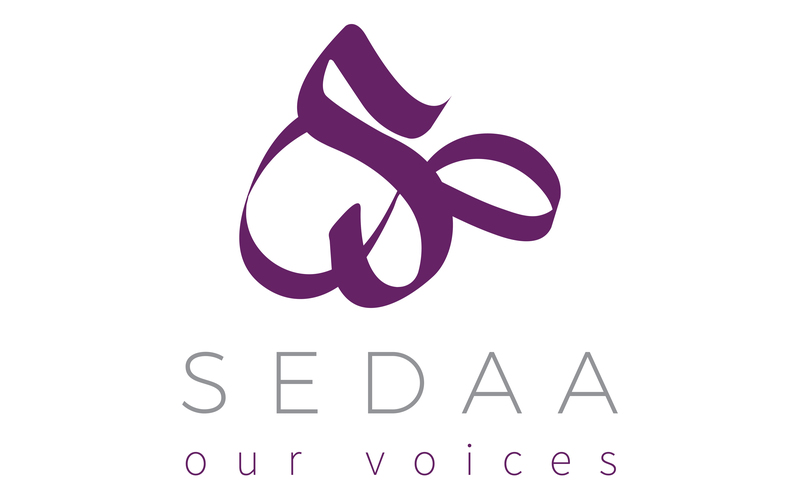 Amina Lone went along on the day and shared her thoughts for Sedaa. I attended a conference. Not extraordinary in itself but this one was held at Google HQ. I can admit that I was excited. It was like being allowed in to Willy Wonka’s chocolate factory. What was unusual was that it was a jointly-run event by Imams Online and Google, billed as a digital summit. A geeky tech fest this was not. It was supposedly open to all. The fact that the overwhelmingly majority of Muslims currently believe women cannot become Imams is seemingly irrelevant. Undeterred, myself and about 18 other women toddled off to the conference. One could have easily mistaken it for a men’s summit. At one point, approximately 180 males were present to 18 females. Aside from the physicality, the culture was macho. When I arrived there were no salaams or handshakes while the brothers all greeted each other. One woman said, ‘Maybe they didn’t know you were Muslim. I wear a hijab, what excuse did they have for ignoring me.” Another said, ‘You are invisible, silly. They cannot see you.” Males heavily dominated the panel discussions too and the first listed Muslim female panellist was three sessions in. Sadly these aspects detracted from what could have been an excellent day. Losing allies makes poor business sense. There were some excellent speakers from varying disciplines and expertise. The panel discussions were somewhat hit and miss and like many things Asian, the room had it own special timing. Asian time as us brownies know is slower then conventional European time. Ask anyone who has attended a South Asian wedding to confirm this. The second panel discussed social media and demonstrated the stark challenges faith communities face. Representatives from Google, Twitter and Facebook were present. The chair Shaukat Warraich — chief editor of Imams Online — set the tone, acknowledging two Imams had received death threats. He thanked them and us for attending despite the fear and intimidation perpetrated by a minority in the Muslim community. There is an increase of intimidation across the board with a special malice reserved for Government-funded activity especially anything perceived to be Prevent-linked. This was not the case here but the post-truth world is alive and well beyond Donald Trump’s America. Extremists of all faiths and none have much in common. 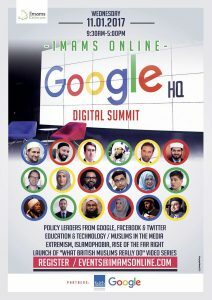 Imams Online Digital Summit at Google HQ in London. L-R: Dr Musharraf Hussain and Shaykh Amer Jamil. I was in attendance with Shahien Taj, director of the Henna Foundation and wanted to show our solidarity and experience of hate crime. Just before the Q&A commenced, Shaukat stated in the name of balance that he was going to take questions in the order of one woman and one man. He duly accepted a question from a woman and then three men: I stuck my hand up; another three men spoke. Maybe Asian time had transmuted numbers too. My hand remained up. In the end a total of two women and eight men were selected to ask questions. My question/comment for what it was worth was acknowledging the climate of fear that is increasing, which meant that we did not share the event on Henna Foundation’s Facebook page for fear of reprisals. I also wanted to point out the fact that women on the frontline have been facing threats, violence and intimidation for a long time and have had to work in those conditions, often without support from the men in our communities. My additional point was for everyone to recognise it is women who are disproportionately trolled, abused and harassed on social media by anonymous keyboard warriors and we all needed to unite to stop this behaviour. Unfortunately it seems only certain types of allies were wanted and they especially don’t come in a non-hijab wearing female form. Some interesting and excellent initiatives were shared. I loved the ‘Build a mosque on Minecraft’ as an engaging and fun use of technology to entice young Muslims. As a mother, I understood and applauded this product, especially as my own children are avid fans of Minecraft, spending hours in its seductive world. We were told about a board game called Five Pillars that could be played with the whole family. Faith being presented in a fun positive way is a great way to engage children. 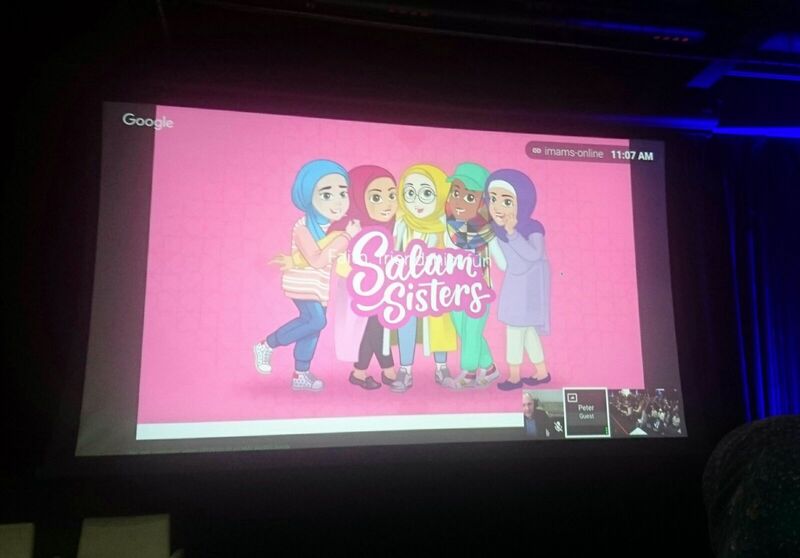 Salam Sisters cartoon showing female characters wearing hijab. Pic credit: Amina Lone. Sadly the thread of gender inequality throughout the day marred progressive inventions. Virtually all the images of women were of veiled females. Even a cartoon image of one online game had all the young girls wearing hijabs. There is a pro-active narrative being pushed out that you are not a ‘proper’ Muslim woman unless you veil. All the Muslim female panellists wore hijabs as did the one young Muslim woman who was part of the organisation and helping out. Reaching out, being open and building trust were espoused as planks for the day. The sad truth is that, like charity, one needs to start in your own back garden. 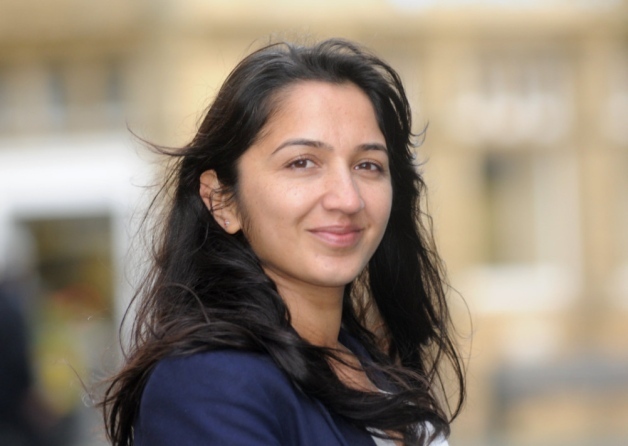 If organisations like Imams Online (who as one women put it, “These are the good guys. Can you imagine what we have to put up with from the bad guys”) cannot reach out, it shows the chasm that continues in faith communities. Maybe that Asian time needs to be brought into the 21 st century. 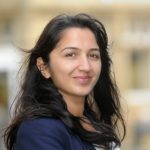 “I urge parents and teachers to educate children about world religions but not to impose any one religion on them, ” is a fair point but I would like to suggest we also educate them about Atheism – a freedom from religious ideas. “Faith being presented in a fun positive way is a great way to engage children.” You mean subtly indoctrinate – and all religions do it. I urge parents and teachers to educate children about world religions but not to impose any one religion on them. Presently, you are all just taking advantage of children’s innocence by indoctrinating them with your beliefs at an age when they lack sufficient critical thought to be sceptical of what they are told, it then takes an enormous effort to overcome such indoctrination as an adult and grasp that your own religion is merely a consequence of the family you were born into. Most people do not and so repeat the process of uncritical transmission of religion on to the next generation.